New Rochelle, NY, October 22, 2018–Board games can engage patients in play and fantasy, and by enabling face-to-face interaction, can help educate patients on health-related knowledge and behaviors. 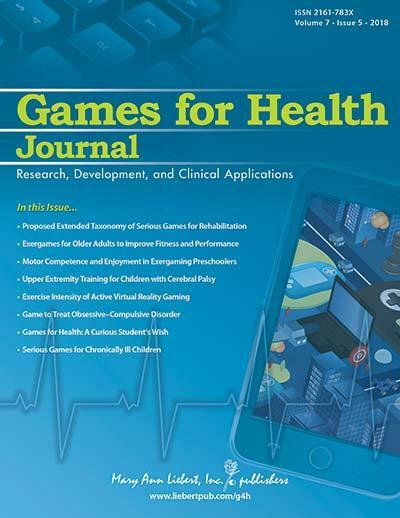 A new systemic review and meta-analysis of trials assessing the outcomes achieved using board games in children through older adults is published in Games for Health, a peer-reviewed publication from Mary Ann Liebert, Inc., publishers. Click here to read the full-text article free on the Games for Health Journal website through November 22, 2018. "While most attention has been given to video games for health, board games can reach large numbers of people and have been generally well received, but have they had the desired effects? Gauthier and colleagues' meta-analysis revealed promising results. Board games may provide a lower cost, widely disseminable method for delivering the benefits of games for health," says Tom Baranowski, PhD, Editor-in-Chief of Games for Health Journal, from USDA/ARS Children's Nutrition Research Center, and Department of Pediatrics, Baylor College of Medicine, Houston, TX.